I had just reached Quito and knew almost nothing about it. Nevertheless, only an hour or so after arriving at a hostel and having a brief conversation with a fellow backpacker, I knew exactly what it was I wanted to do in the city. My new friend’s brother had travelled through Ecuador some years ago and had but one suggestion: visit the male prison. We spent the rest of the day researching British prisoners in Quito and came up with a list of names. The next morning we were standing on the road by the hostel trying to find a taxi driver willing enough to take us there. Very soon we were queuing up outside the prison along with wives, girlfriends, parents, children, and what I now know were prostitutes. At 1pm the women were waved through, followed shortly by us men. A guard stood at the head of the queue with two A4 sheets of names; at first I thought we might have had to pre-register our intent, but in fact he was checking our names against a blacklist. Our names were not on there (I would have been rather concerned if they were) and we were duly ushered along to a desk where the guards seemed to be doing nothing other than decide whether they liked our faces before stamping our arms. Still outside the high walls of the compound, we handed our passports over to two chatting ladies who gave us no receipt but another arm stamp. Next, a guard asked who we were there to see. We stated the name of a British prisoner whom we thought was there. “Which wing is he then?” asked the guard. “Through there,” he pointed in the direction of a doorway in which mingled a large group of other guards. We walked through and they pulled us to one side to be searched. The ‘search’ comprised a quick look inside our bag of food we’d brought along as a present and a light pat on our pockets. They didn’t bother to see what I had in my shoes nor whether the packet of chewing gum really was just that. 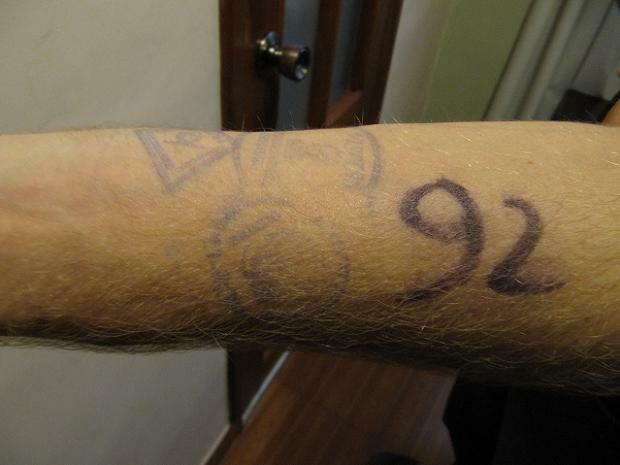 Another stamp, and now a number written in marker pen on our arms. We were beckoned over to a final guard who put an ultraviolet mark on our arms. This, he explained, would tell the guards we’re not prisoners. Very useful. Left alone in that room we suddenly feel very intimidated, as if we’re on display for the amusement of the prisoners. One young Ecuadorian calls us over. He asks us, in Spanish, who we’re there to see. We repeat the name, our supposed pass into the prison. “Oh yes, I know him, come in here with me,” he says. Something about his mannerisms prevents us from trusting him. We wander slowly away and closer to one of the other gates. A young, white Bulgarian smiles back at us from the other side. “You want to come in?” he asks in perfect English, Why not? A guard obligingly unlocks the metal door and stands aside to allow us through. The Bulgarian, Aleks*, shakes our hands enthusiastically and asks us again who we’re there for. “Oh, he was released ages ago,” he tells us. “There’s only one British guy here now and no-one talks to him because he’s addicted to crack and in too much trouble with the gangs.” We decide it’s a good idea not to meet this man, and Aleks willingly agrees to be our guide around the complex. The prisoners’ regime is relaxed to say the least. They are locked into their cells overnight, woken up at 6am and then have until 9pm to do what they want within the confines of the walls. Inmates do what they can to pass the time and many take advantage of the educational classes such us carpentry (the resulting products are sold on the outside by the prisoners’ families). There are also official job opportunities, like helping with the printing of documents. Others have started up their own businesses ranging from running restaurants to money lending. In the courtyard stands, amongst others, a stall behind which two Germans cook pizza and steak. They wave at us and beckon us over, handing us each a cookie. We offer Aleks lunch and together we sit down as a Russian comes over to take our orders and deliver cutlery. I take the opportunity to ask Aleks about the events leading up to his arrest. He and a friend were approached in Bulgaria with regards to doing a drug run from Ecuador. They were offered €15000 each for the job. He spent two enjoyable weeks in Ecuador before taking possession of the shipment. From the moment he walked into the airport he was shaking and sweating, pulling his hoodie over his head to conceal his fear. The Germans have a similar story. They were on holiday in Ecuador and saw an opportunity to make a lot of money very quickly. They tried to smuggle 300g between them through customs, got caught and were sentenced to six years each. Aleks’s judge was lenient and gave him just four years. Aleks has to knock before entering because one of his cell mates is in there with his visiting girlfriend. He explains that he ‘bought’ the cell for $2000, which as well as all the belongings gives him various rights such as not having to vacate the cell during the day, a safe spot on the top floor and cell mates of his choice. It also means you can have congenial overnight visits: if one doesn’t have a cell, one has to squeeze in with thirty others into a small room while cell owners take care of business. Everything revolves around money. Aleks estimates that $6 or $7 a day is enough to have a comfortable and safe life. With that you can eat at a stall once a day, buy your own food for cooking, and pay other people to do certain jobs. Addicts hang around everywhere waiting for someone to pay them to clean dishes or do laundry. Paying people is also a convenient way of ensuring you won’t be a target – people won’t jeopardise the chance to continue making money from you. Dodgy businesses abound. One ‘office’, as these enterprising cells are known, brews alcohol, another dishes out drugs. This is where corruption is most evident: guards are paid off weekly and no-one gets in trouble. It seems the best idea is to find a safe business opportunity – such as the man who has the ‘licence’ to sell cigarettes – and keep clean. That way you’ll come out with more money than you went in with. While I was surprised to see the relative freedom and good conditions the inmates have, I can see how the sheer isolation and monotony is punishment enough. The (many) foreigners may have the access to enough money to make their lives snug, but they’re shunned by their former friends and family. The ones I spoke to seemed happy on the face of it, but that front is a thin veil over their desperation to leave the surreal community. “It must be nice to have so many friends here,” I tell one of the Germans, struggling to think of anything better to say. *Names and nationalities have been changed. Jason Smith is currently exploring the world, bumping into as many folk as he can. Follow his progress at www.traveleyesopen.com.